We haven't heard much from Microsoft's Cortana, the voice assistant that's built into Windows 10 and available in app form on Android and iOS, in a while. Amazon and Google, with their respective Alexa and Assistant/Home brands, have been far more vocal in the last few months. Today the Cortana app gets its first major update in the better part of a year. And in a move that probably should have come a lot sooner, the mobile version of Cortana is now available in the UK. The new interface is, well, purple. It's very purple, almost like the app has been sponsored by Nexium and the Prince estate. The layout is simpler, much more focused on the search bar, which makes sense. As expected the app syncs with a Microsoft account to make use of settings and search history across Windows, Windows Phone, iOS, and Android. 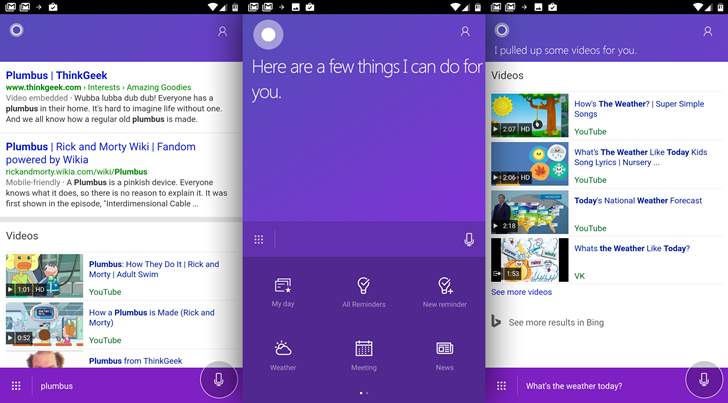 The "Hey Cortana" voice command is available, but only when the app is in focus on your phone or tablet. Unfortunately there doesn't seem to be much in the way of new features. Cortana retains basic assistant functions like reminders, quick access to sports and weather, et cetera, but its ability to dynamically find and display content seems to be lacking. For example, a search for "what's the weather today?" pops up a series of videos, not a weather report. If for some reason you can't download the app in the Play Store, it's also available on APK Mirror.